Jack Prodanovich lived the American dream. A first generation American, he was born in 1913 in Tonopah, Nevada to Yugoslavian Immigrant parents. When his father, a miner, contracted Black Lung Disease, the family moved to San Diego in 1915, settling in the Old Town area, where he learned to swim in the San Diego River. His father died at 48, leaving his mother alone to raise his family of four brothers and one sister. Jack died Thursday, February 7, 2008, at the age 94, of respiratory failure after a brief hospitalization. Out of necessity, a spirit of thrift, practicality and coupled with his enthusiasm, inquisitiveness and zest for life paved the way for great adventures and inventions. Jack was drawn to the ocean and loved to surf and dive. Before 1930, the sports of free diving and Scuba diving were unknown. In 1933, after graduating from Point Loma High, he and close buddies Glenn Orr and Ben Stone began 'skin' diving to supply food for their families during the Depression. In 1934, joined by Jack Corbelley and Bill Batzloff, Jack formed an active group of dive buddies, believed to be the first diving club in the United States, if not the world. They were named The Bottom Scratchers as a joke because they were always underwater scratching the bottom of the ocean to feed families and friends. To qualify for membership in The Bottom Scratchers, bring up 3 abalones from a depth of 30 feet, catch a shark of any kind with your bare hands and haul up a live lobster from a slippery underwater ledge. This was at a time when swimfins didn't exist! In addition to their bravado and great adventures, the club, an exclusive, men's only dive club, valued friendship, good sportsmanship, conservation and responsible harvesting of seafood/fish. Once numbering 20 members, only Bo Smith, Marty Pasos and Jim Stewart, and Earl Murray survive. By the late 1930's Jack and his buddies had become more proficient at ocean diving, precipitating the quest to develop equipment to assist in their diving exploits. Jack first dove with individual eye goggles, which due to pressure when diving, caused him to term them 'eye gougers.' As a solution, he designed a mask with a single plate of glass that was fashioned after the stereoscope used to view the silent Nickelodeons movies of the time. Using the template from the stereoscope, he took plate glass from an automobile dashboard gauge and produced a single lens diving mask, believed to be the first of its kind. He went on to develop an iron for prying abalone off the reefs. He began spear fishing with a simple spear, but to assist in catching larger fish, he developed a trigger-activated spear gun. Many years later, after a self-propelled spear prop he made for a James Bond movie, 'The Spy Who Loved Me' ricocheted off the side of the pool, he became blind in one eye. 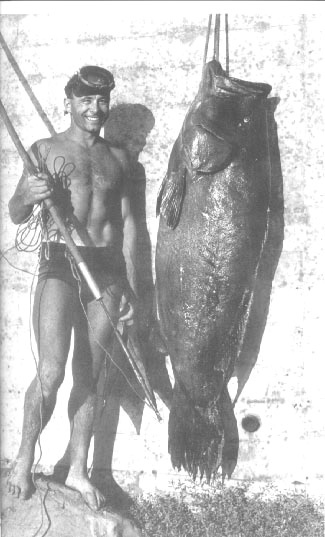 In 1946, Jack became President of the Bottom Scratchers club after catching the largest fish ever caught single handed by underwater spearing - a 207 pound Broomtail Grouper. In May 1949, the club was featured in a 17-page 'National Geographic' article, 'Goggle Fishing in California Waters' by David Hellyer with photographs by Lamar Boren. Later, Boren filmed the first segment of the immensely popular series Sea Hunt using the Bottom Scratchers as models. Jack made much of the equipment used in the show. These first enthusiasts contributed heavily to the 'Skin Diver Magazine' that chronicled the sport as everyday people began to explore the oceans. The Bottom Scratchers were responsible for making spearfishing legal. Early California laws forbid taking fish with a spear. The daring exploits of the Bottom Scratchers helped make a lasting change to the fishing code to allow spearfishing by divers. Over time, the club's conservation ethic grew. This Memorial Day weekend will be the inauguration of the 1st Annual Jack Prodanovich White Seabass Open benefiting the Hubb's -Seaworld Research Institute's WSB research, hatchery and restocking programs. Demonstrate to the community at large that Spearfishermen are leading edge conservationists by practicing responsible take. Dedicated family man, loving husband and father, friend and mentor, Jack Prodanovich made this world a better place and enriched the lives of all he touched. Jack is survived by his wife of 67 years, Gertrude, sons, Milo and Robin, daughter Kristy and numerous, grand children, great-grandchildren, nieces and nephews.